c. Disassembly - upper body -Figure 2. Slide the float shaft (1) from the float lever bracket and remove the float and lever assembly (2). Discard the float shaft. If the shaft is difficult to remove, insert the blade of a screwdriver in the slot at the tip of one arm of the float bracket. Turn the screwdriver slightly to free the pin. 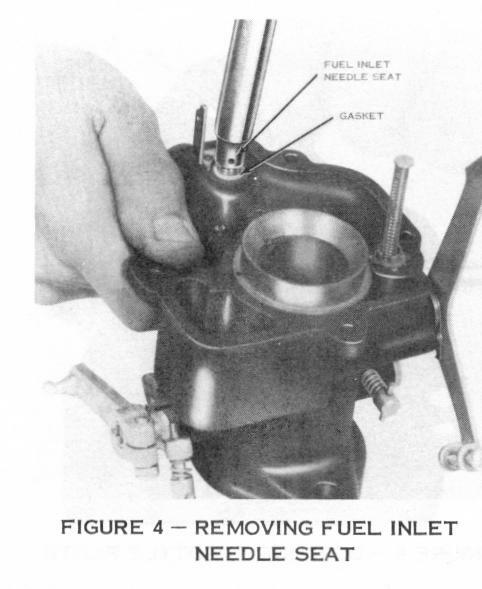 (2) Remove and discard the fuel inlet needle (3), seat (4), and gasket (5) assembly. Remove the screw (6) and washer (7) holding the throttle kicker lever to the upper body. 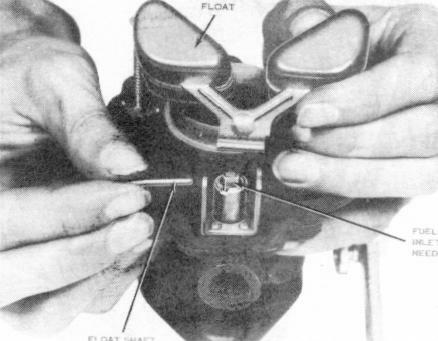 Remove the throttle kicker lever (8) and spring (9). Do not remove the adjusting screw in the top of the lever. This has been set at the factory to provide proper throttle opening during full choking. Instructions for re-setting this adjusting screw are given in the reassembly procedure. (4) With a 7/16 "box wrench, remove the distributor vacuum line fitting (10). Loosen the distributor vacuum passage jet (11) with a thin narrow-bladed screwdriver. 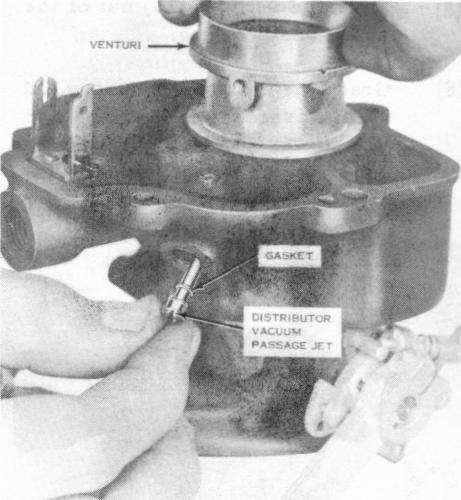 Invert and shake the upper body assembly, holding a hand below the hole to catch the jet and its gasket (12). Discard the gasket.